Let us conduct in a place which can contribute to the development of the place. Just like Modi holding Police conferences in different parts of the country other than delhi..
ramana wrote: Which country you are in US or desh? If latter forget it!!!! And even if its the former so also forget it. I would like to bring to notice couple of fellows who are the path to become Jihadists. Havinhg interacted with them for almost 3 years - i sense the change. These guys are IT savy. How and to whom should i bring them to notice? any twists in Make in India and MTCR? It should be, but is there a twist which nullifies Make in India? Does the babudom really believe that conventional superiority prevents an escalation? Interesting take !!! from which book is this extract? who is who in the frame? 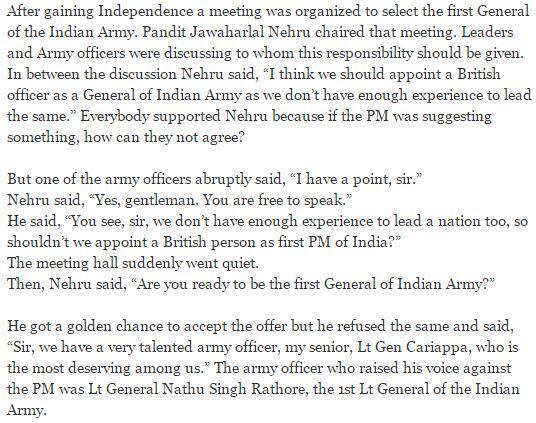 So congis go ahead and announce the next army chief. Can the good Lt. Gen. decline and say...he will wait until the new Govt. is in place? anmol wrote: Gives credence to @mediacrooks theory that TimesGroup got money to do all this. So Sangita Richard's in-laws work in the US embassy. And her husband and kids were Fedex-ed to the US, while her visa status was dubious!!! that means her husband is a US citizen ???? If that was the case, why was the maid asking for a normal indian passport? Met him in Atlanta few years ago...gave a beautiful talk which opened my eyes and views on pakis. Loved his papers at SAAG and later in his blog...A true soldier of Bharat...Koti pranams to him. Is there a way to know where he is cremated. It should be marked.